Our last post, we added some pictures of Fiz’s barefoot feet (and how awful they were looking) and talked about our hoof goals leading up to show season. 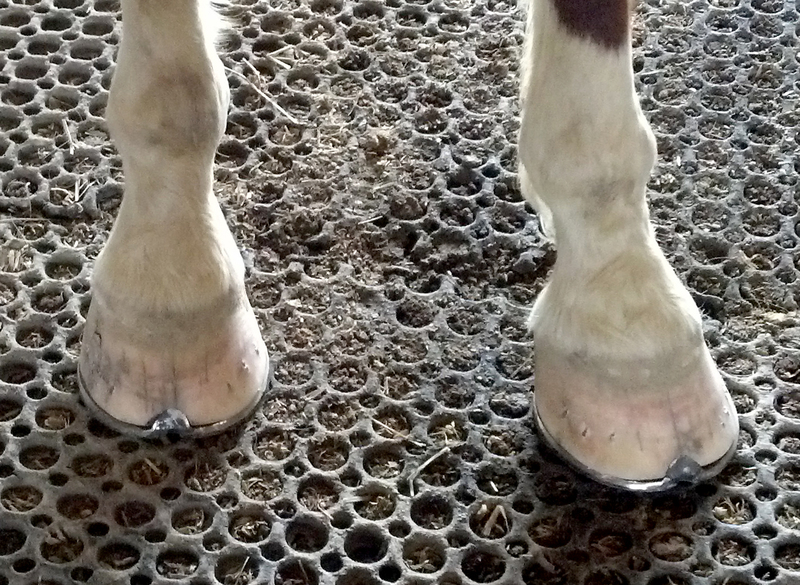 Today, Fiz had an appointment with his farrier, Bobby Ordner, who made and custom fit shoes for his front feet. Back feet will likely be done next time around. Bobby gave us a “progress report” on Fiz’s hooves, and was VERY informative and helpful. He worked for nearly 2 hours custom making shoes, and he also hot fitted them so they would be a perfect fit. Fiz didn’t mind, he stood nicely for almost 2 hours while the shoes were being made even, and didn’t even flinch at all the tools being used, the smoke from the hot shoes, nothing! Bobby says he’d like to see the back feet be a little more hard, more growth in the heels of all 4, and just a bit more toe all around and we will be where we need to be. He said the farriers formula and the Keratex (which we just ordered today) is a good game plan and will have us where we want to be definitely by the time we want to show. Anyway, here is the end result.